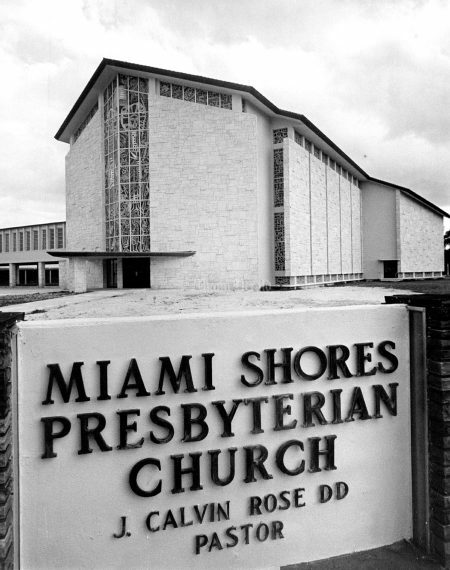 Founded in 1932, Miami Shores has approximately 11,000 residents and 3,000 homes, many of which are historic. 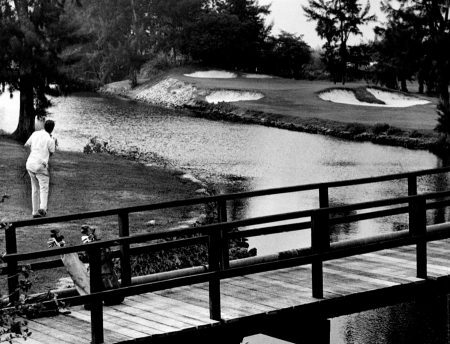 Its story began in the years after the devastation of the Civil War. In the postwar era, William Gleason served as Florida’s lieutenant governor, and in the early 1870s, he settled in the area that would become Miami Shores. 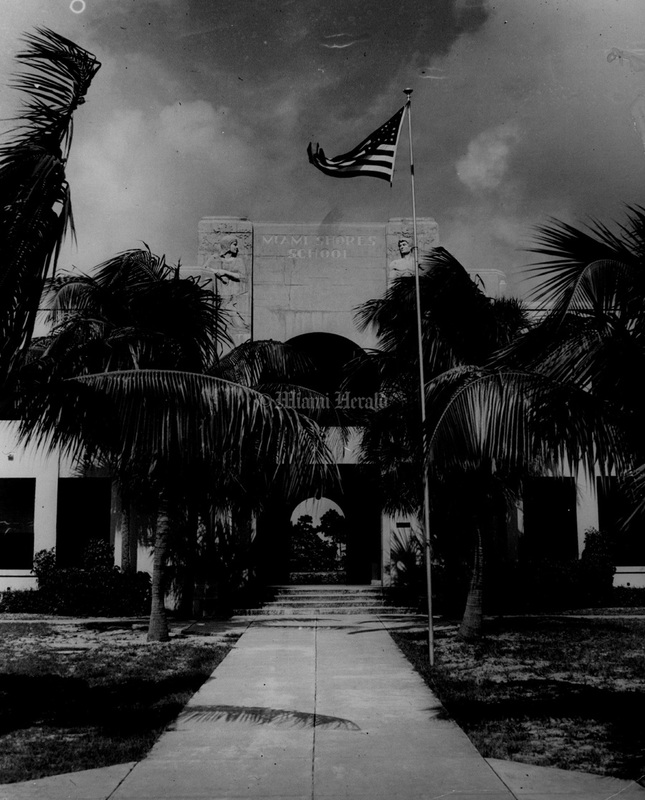 Gleason named the community Biscayne, and in those days the new community temporarily served as the home of the Dade County Court and County Commission. In the early 1920s, developer Hugh Anderson decided it was the perfect place for a planned community. 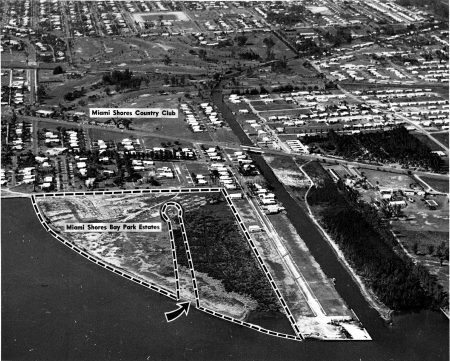 Anderson’s company, Shoreland Co., advertised the area as ”America’s Mediterranean” and managed to sell 400 acres of land for more than $22 million. In 1931, Miami Shores Village filed papers to incorporate but there was a problem. 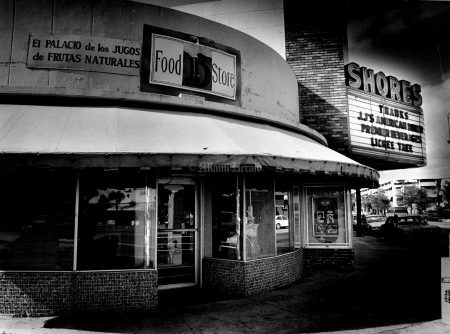 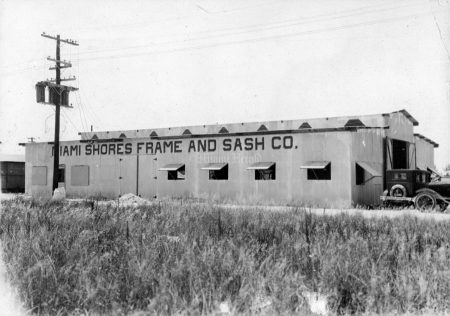 Another area had already incorporated as the town of Miami Shores. 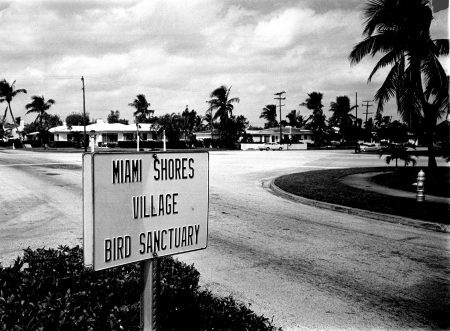 There was some dispute over the name, but the more heavily populated village won. 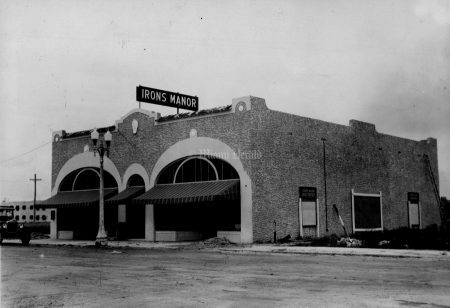 With that obstacle cleared, Miami Shores Village was incorporated on Jan. 2, 1932, covering an area of 1,500 acres. 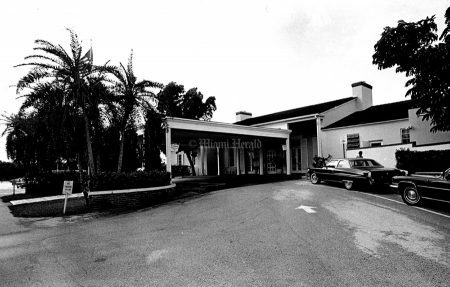 With this came the Miami Shores Country Club, the Chamber of Commerce, several schools, its own police department, churches and a Women’s Club. 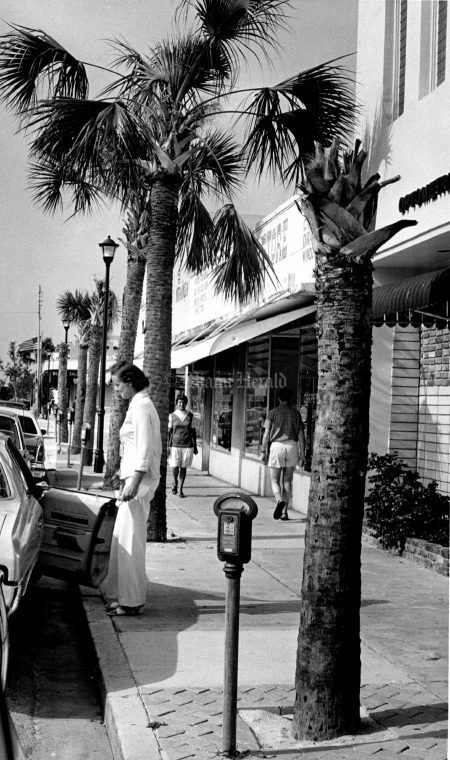 In the decades that have passed since those early, formative years, the village has not visibly changed much. 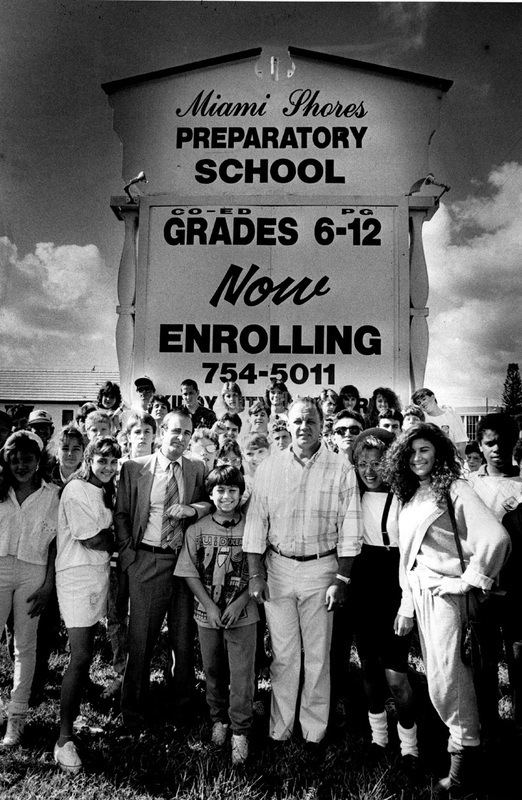 2/7/1989, Rick McCawley/Miami Herald: Miami Shores Preparatory School. 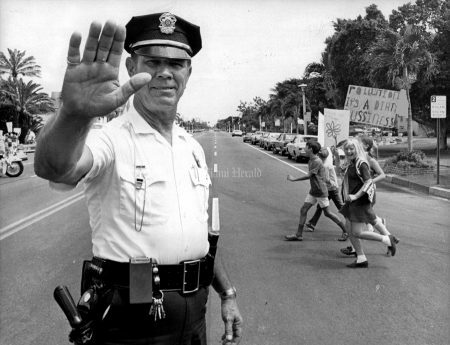 11/22/1988, Rick McCawley/Miami Herald: Miami Shores police. 2/23/1989, Rick Mccawley/Miami Herald: Miami Shores. 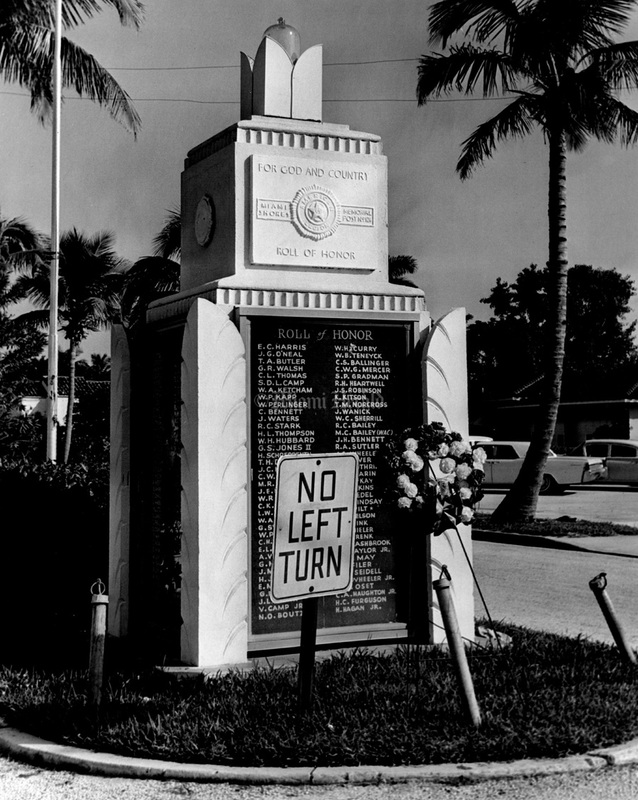 11/11/1964, Bill Sanders/Miami Herald: Miami Shores Memorial to veterans. 10/22/1964, John Walther/Miami Herald: Miami Shores homes. 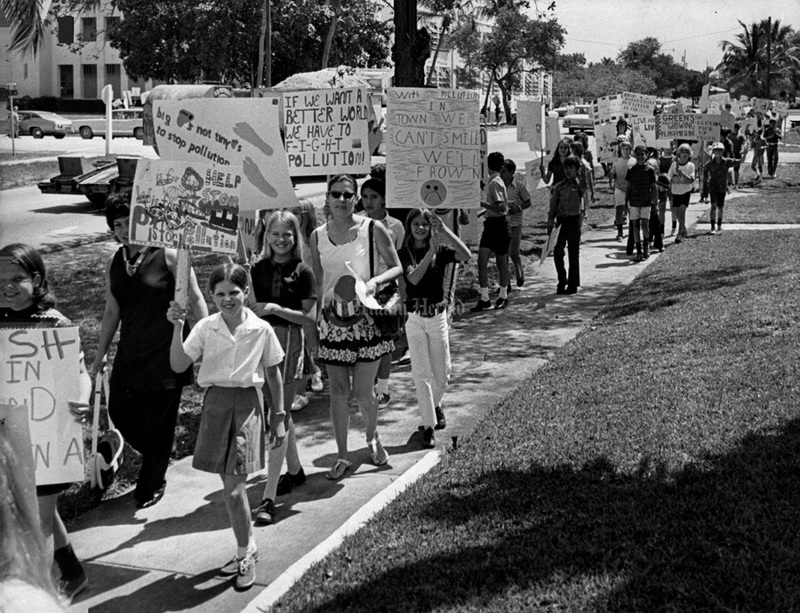 4/19/1972, Dave Didio/Miami Herald: Miami Shores Elementary kids on anti-pollution march. 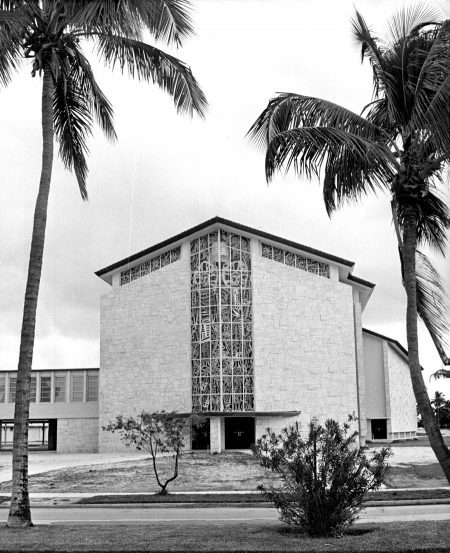 11/2/1968, Joe Schuppe/Miami Herald: Miami Shores Presbyterian Church. 1/16/1983, Caro Guzy/Miami Herald: "Old Pump House". 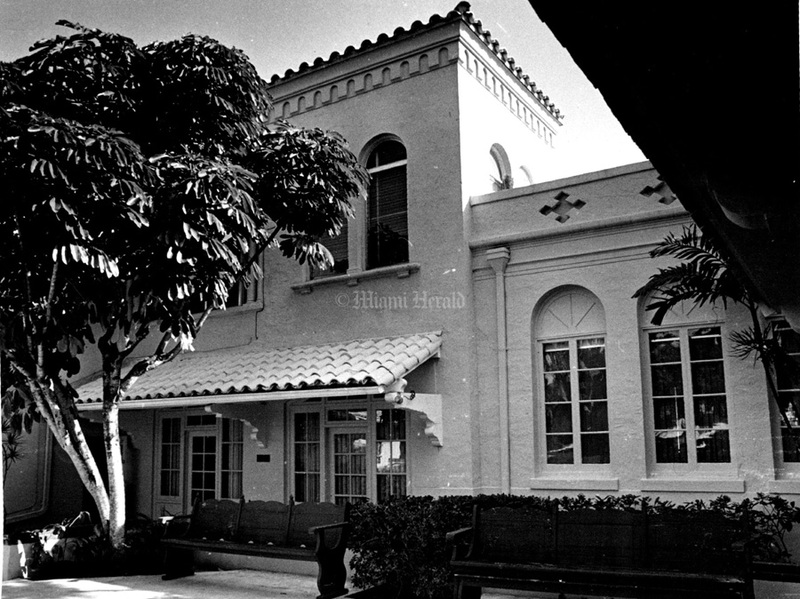 Miami Shores Historic Preservation Board. 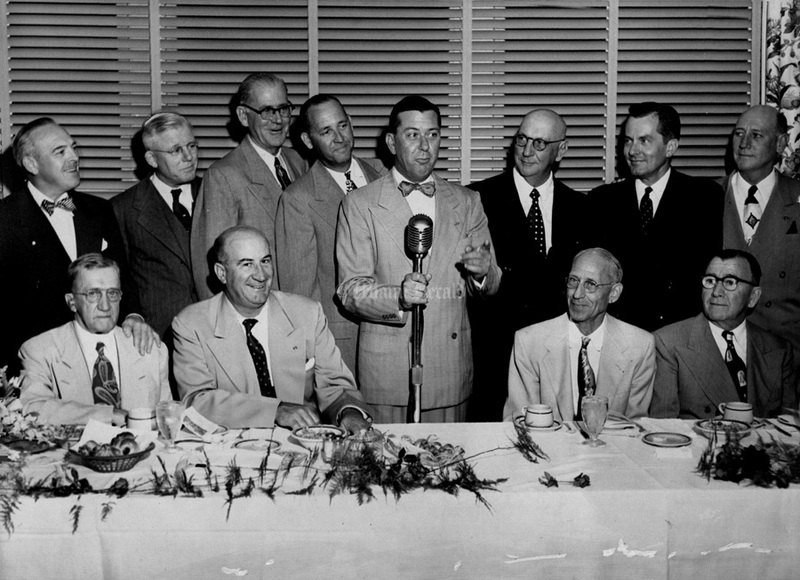 6/2/1926, Edwards/Miami Herald: Miami Shores Frame & Sash Co.
2/20/1952: Eleven Former Mayors and the present mayor of Miami Shores are shown together at the anniversary celebration Tuesday night. 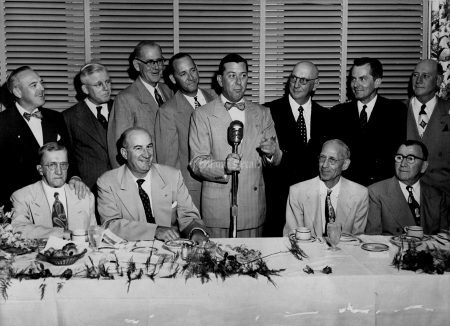 Seated, left to right, W. Meade Stockdel, Frank O. Pruitt, Otto H. Goll, and L. G. McCaffrey; Standing, Roy MacKenzie, Stanley Milledge, Marion B. Arnold, Walter G. Ernest, Mayor M.E. (Duke) Reynolds, John Carlisle, John G. Thompson, and George A. Frix. Former Mayor, Oscar E. Dooly, Jr., could not attend. 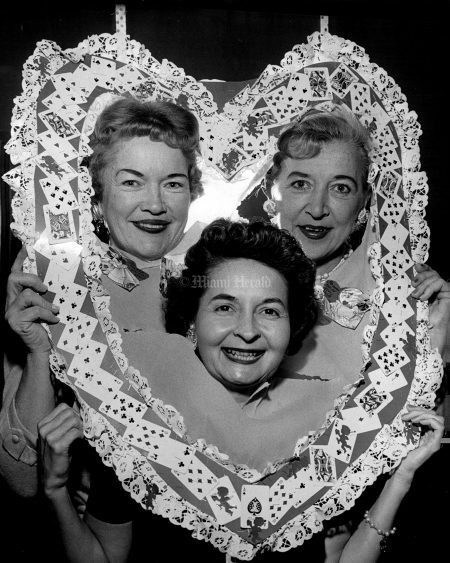 Undated, John Walther/Miami Herald: Left to Right, Mrs. Edwin H. Smith, Mrs. James C. Nunge, Mrs. William F. Hemminger of the Miami Shores Women's Club. 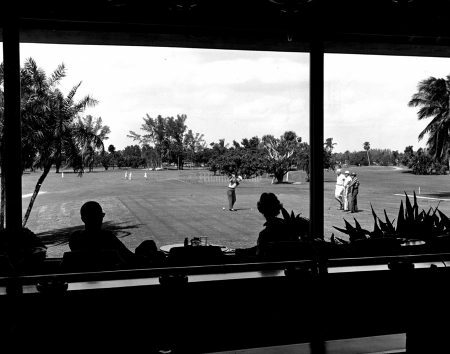 10/22/1964, John Walters/Miami Herald: Miami Shores Country Club from inside club house. 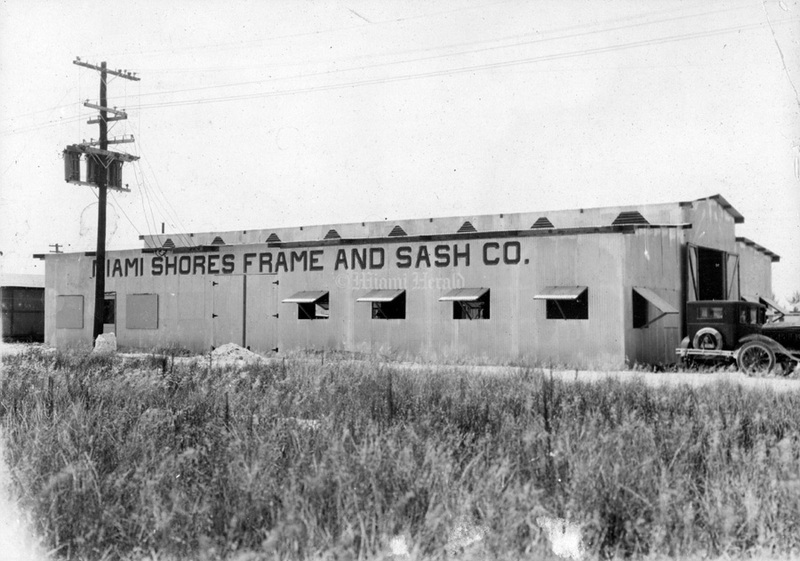 6/29/1926, Miami Herald: Irons Manor field office in Miami Shores. 9/5/1952, Bill Sanders/Miami Herald: Miami Shores Baptist Church. 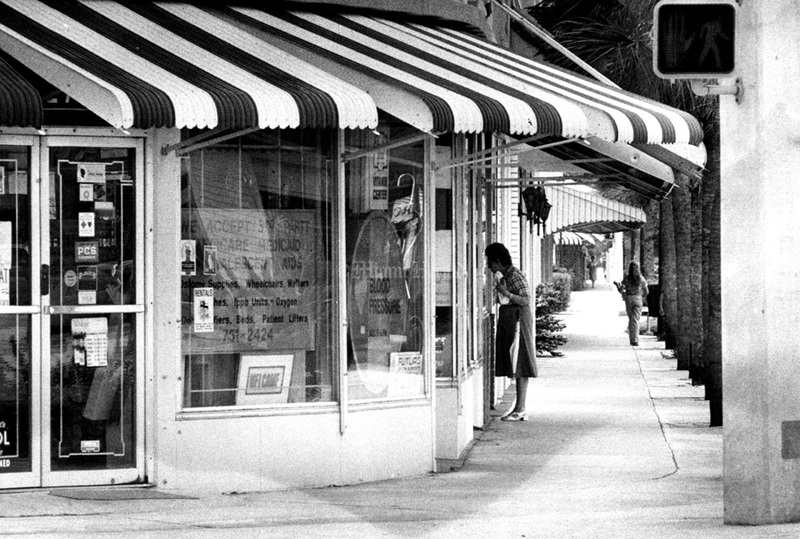 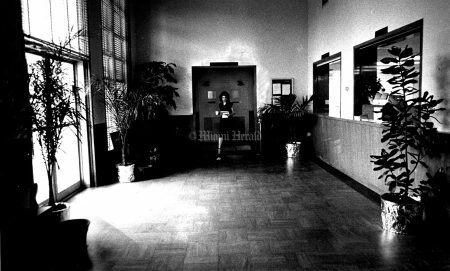 10/13/1983, Robin Shields/Miami Herald: A lone window shopper pauses to look in the window of Center Pharmacy on NE 2nd Ave.
5/29/1938: Main entrance Miami Shores Elementary School. 11/19/1987, Rick McCawley/Miami Herald: Miami Shores Theatre at 9806 NE 2nd Ave.
1/23/1953: Plans for developing the last major area of bayfront land in Miami Shores were announced. 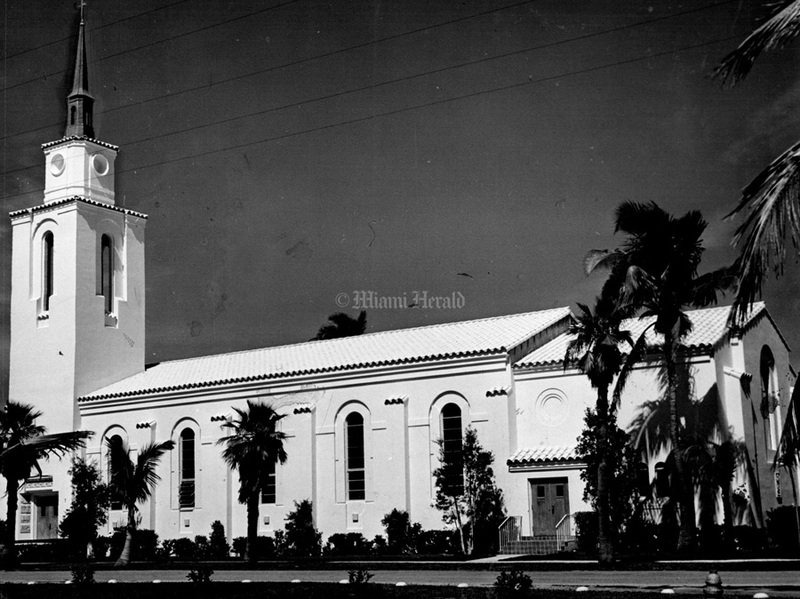 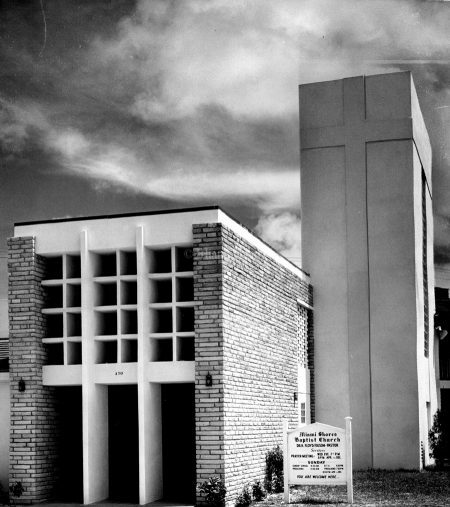 12/27/1954, Bob East/Miami Herald: Miami Shores Community Church. 4/19/1972, Dave Didio/Miami Herald: Miami Shores Police office Bill Chester holds traffic for kids from shores elementary school on anti - pollution march. 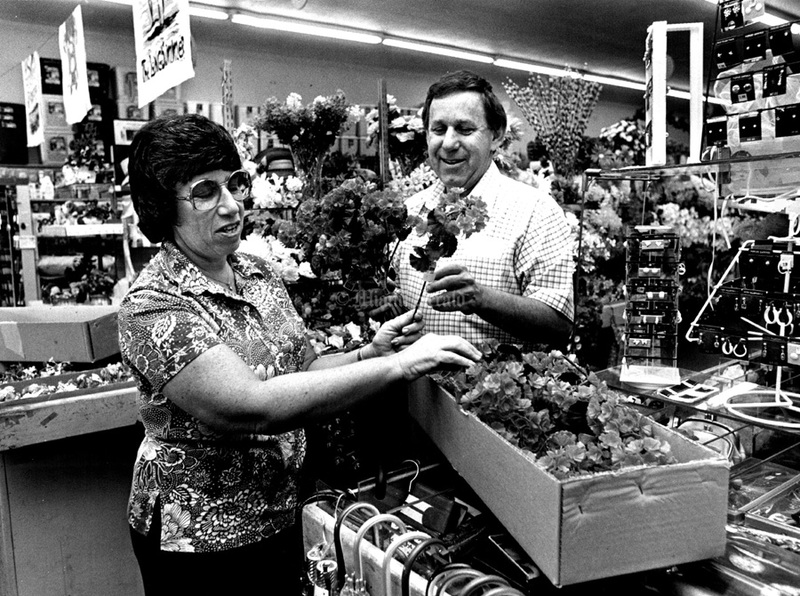 3/1/1982, Mary Lou Foy/Miami Herald: Mr and Mrs Burt Simon stocking Merchandise at their Miami Shores 5 and 10c store. 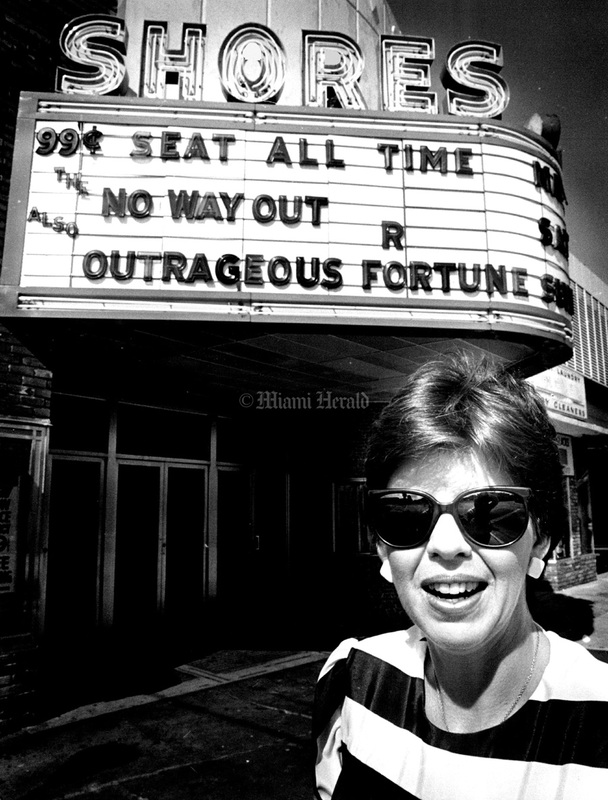 6/3/1982, Carol Guzy/Miami Herald: Miami Shores Village Hall. 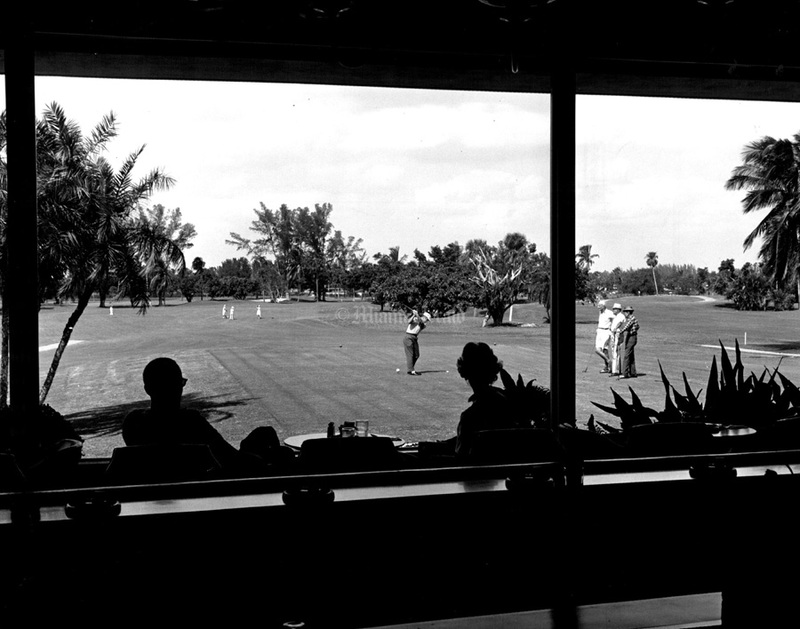 Undated, Miami Herald: Miami Shores Country Club And Golf Course. 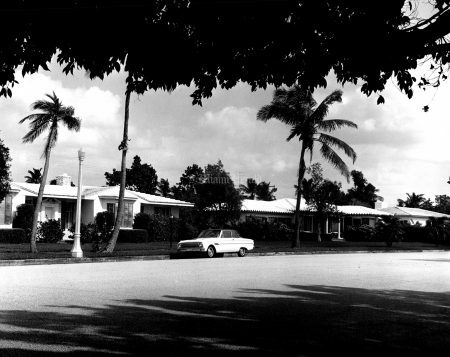 10/22/1964, John Walther/Miami Herald: Miami Shores. 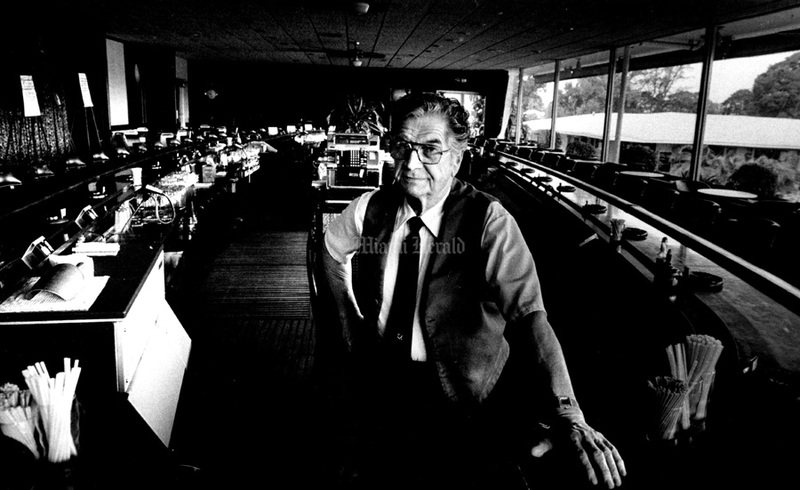 8/2/1981, Carol Guzy/Miami Herald: Sal Scianna, Bartender at Miami Shores Country Club. 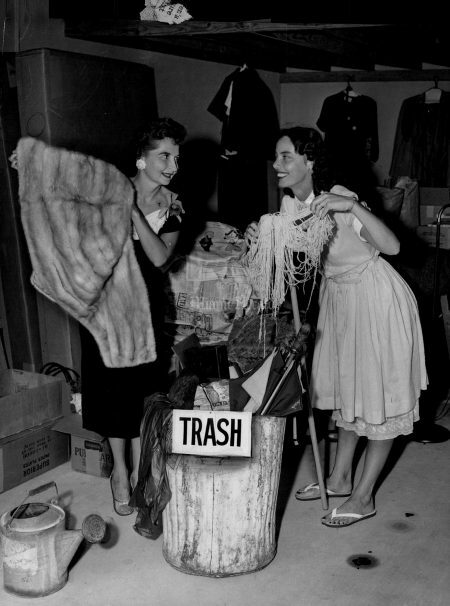 4/4/1980: Miami Shores - The 9700 Block & NE 7 Ave.
9/22/1957, Bill Sanders/Miami Herald: Anything goes in a Trash and Treasure sale at the Miami Shores Women's Club. 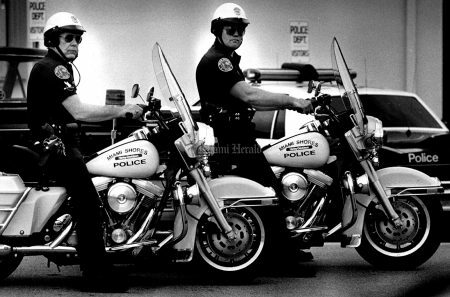 10/21/1990, C.W. 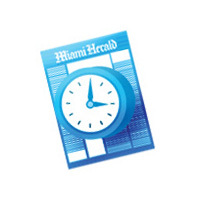 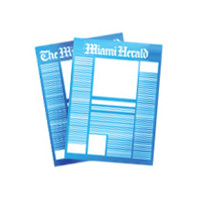 Griffin/Miami Herald: Miami Shores home. 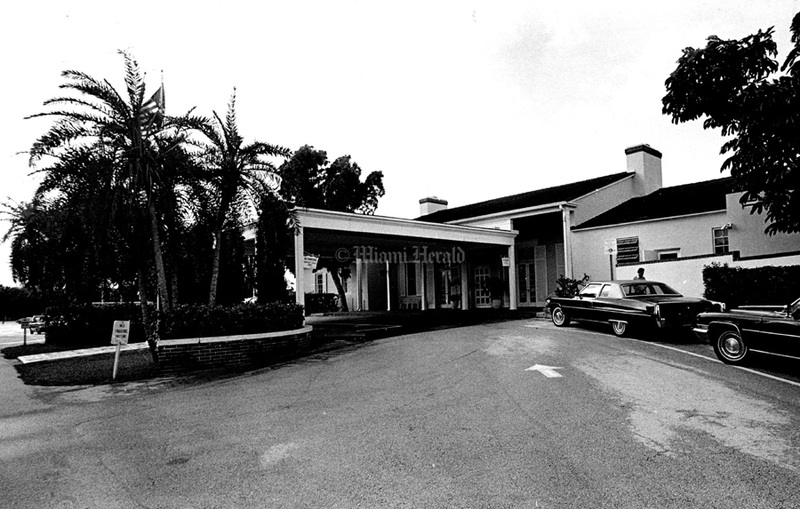 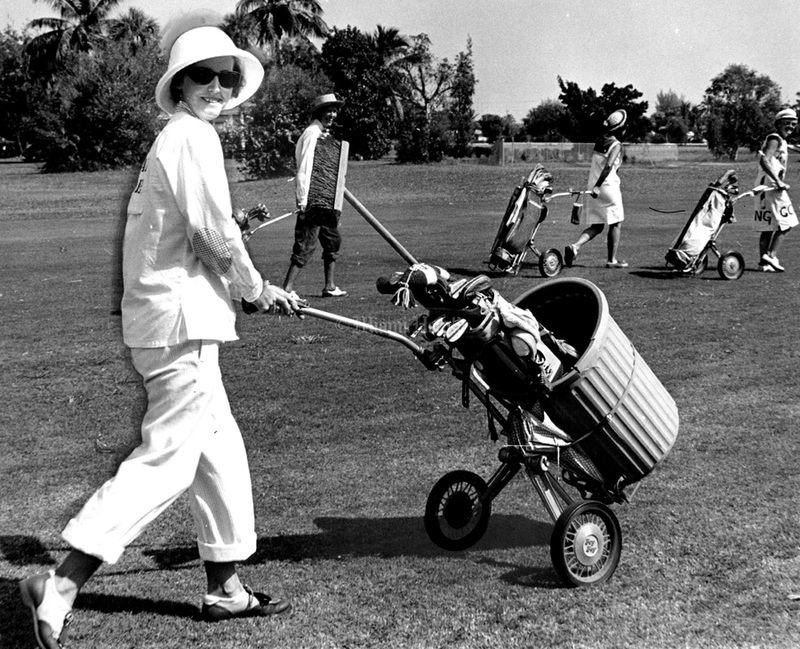 12/29/1978, Alan Freund/Miami Herald: Miami Shores Country Club. 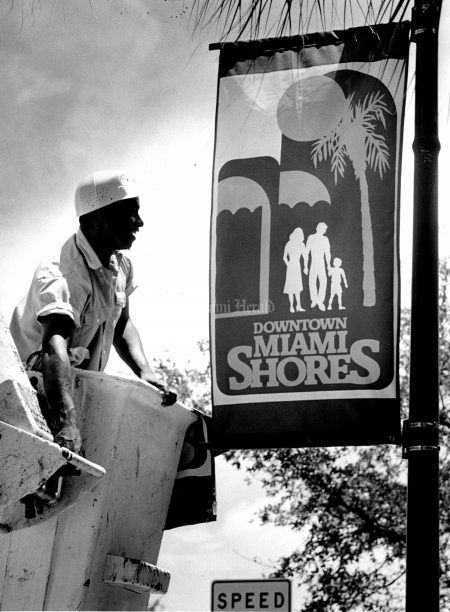 7/20/1989, Rick McCawley/Miami Herald: James Bradley puts up the new downtown banners. 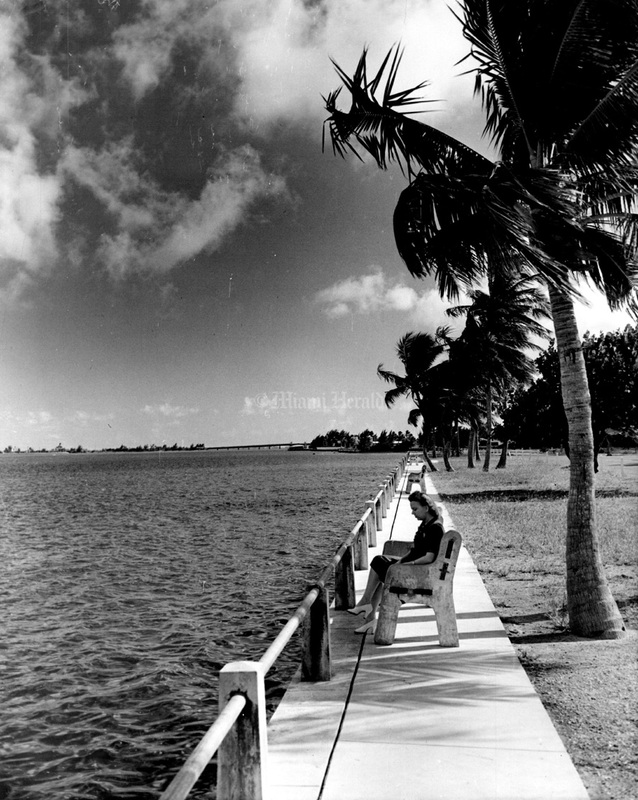 Undated: Waterfront scene in Miami Shores. 10/25/1963, John Walther/Miami Herald: Mrs. Ruth Ness won the "most authentic" prize coming as a Miami Shores Sanitation worker. The golf tournament was won by Mrs. Joe San Fillipo and Mrs. Leonard Gieske. 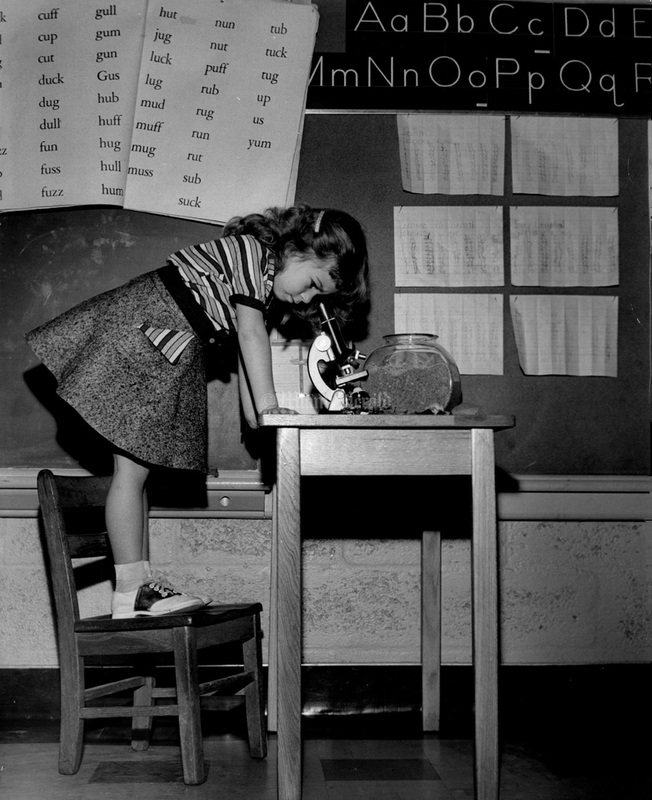 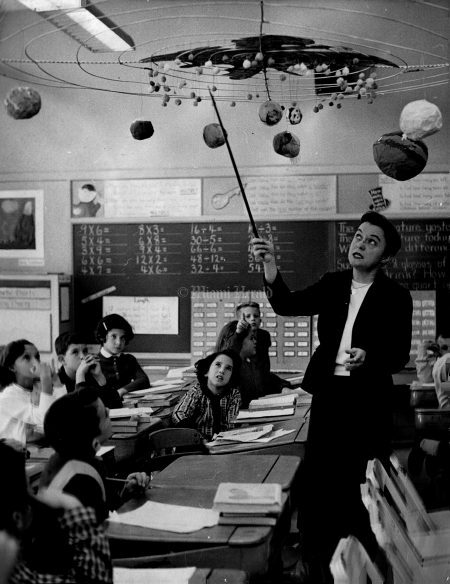 12/12/1957, Steve Wever/Miami Herald: Mrs. Katie Ledwell Explains Universe, a class project, to her students at Miami Shores Elementary. 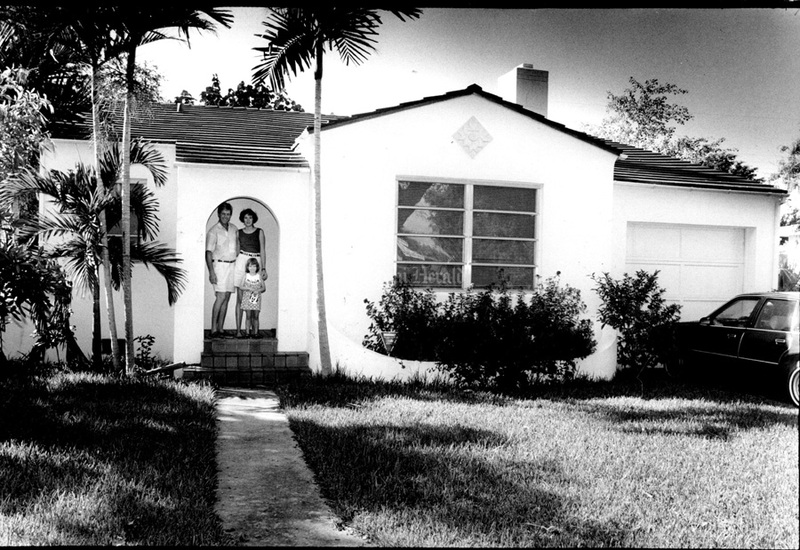 2/8/1960, John Pineda/Miami Herald: First grade student at Miami Shores.